Dietician Heather Bauer, who practices in New York City, is the creator of the Wall Street Diet. Bauer’s clients include those who work long hours with many business dinners and a lot of work-related travel. The Wall Street Diet is targeted towards dieters who have a similar hectic work schedule and do not wish to change their lifestyle but still would like to lose weight and maintain their health. Bauer says that “weight loss is not about willpower, it’s about strategy” and presents simple dieting solutions for people who don’t have the time to count calories or to spend on food preparation. Initially you will decide whether you are a clean plate clubber or a controlled eater. This will determine which plan you will follow in regards to the way you manage your snacks and select food and meal portions. You then are instructed to choose a few foods you feel that you cannot live without, such as chocolate or wine for example, and then use the guidelines in the book to incorporate them into your diet. An important part of the program involves learning how to manage your diet in business situations. Bauer includes advice such as checking restaurant menus in advance for healthy options and offers guidance as to what are the best foods to eat at buffets. She also provides tricks on how to be a ‘stealth dieter’ so that your food choices won’t draw attention at business meetings. Also included are calorie cheat sheets that help you keep control of your calories without the need for complicated calculations. Fresh fruit and vegetables, low fat yogurt, whole grains, nuts, turkey, eggs, seafood, beef, chicken. Search for other healthy meal ideas here. The Wall Street Diet advises dieters to gradually implement a workout routine. The book includes 20 minute exercise routines that should be done three times a week. She also offers advice on exercise videos and how to workout while you are traveling. The Wall Street Diet retails at $24.95. Offers practical advice and solutions. Dieters do not need to give up their favorite foods. Can be maintained as a lifestyle approach to weight management. No calorie counting or prepackaged meals. Good for dieters who eat out a lot. Allows regular snacks, which reduces the likelihood of experiencing hunger. May not appeal to dieters who are outside of the target audience. Focused mainly on eating out. Does not include recipes or a detailed meal plan. 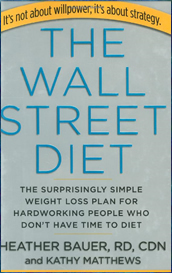 The Wall Street Diet will most appeal to dieters that have a busy lifestyle and eat out often. Bauer offers these dieters simple and practical real-life strategies on how to lose weight and stay healthy without the need to make any major lifestyle changes.